No other network in the industry competes with Exreal. We dare you to compare the quality of our network and carriers to those in the industry. The network consists of eight (8) different Tier one backbone providers clubbed together to form the best network infrastructure in the industry, with the the lowest ping times, lowest latency, and the best redundancy possible. The backbone border routers are Juniper M20's with fully redundant switching layer comprising of a certified six pack design of Cisco™ 6500 series switches. All customer access switches in the datacenter, and there are hundreds of them, are Cisco™ 2950 series switches designed for maximum performance and uptime availability. 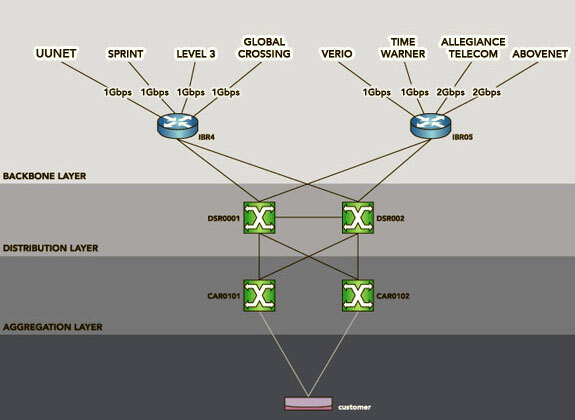 The current backbond providers are UUNet (GigE), Sprint (GigE), Level 3 (GigE), Global Crossing (GigE), Verio (GigE), Time Warner (GigE), Allegiance Telecom (2 x GigE), and AboveNet (2 x GigE).